A little explanation may be in order. My parents have an iSight camera and when we think about it, we do some videoconferencing so they can see Ben in action and talk at him. He's starting to get the idea that he can interact with them. My in-laws just upgraded from dial-up to cable modem service and they now have an iSight, too. 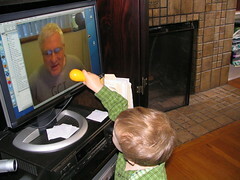 This morning, talking to my dad, Ben was playing with various things, like sticky notes and brand-name colored wheat dough, and he suddenly came up to our LCD and pushed a wooden hamburger bun at it. I thought he was playing with the screen and asked him to stop. He came back with the bun a couple times, and I realized he was trying to feed my dad. I asked him if he could give grandpa a chicken leg, and off he went to get the pretend chicken leg, and tried to offer it. Little did he know my dad is a vegetarian.